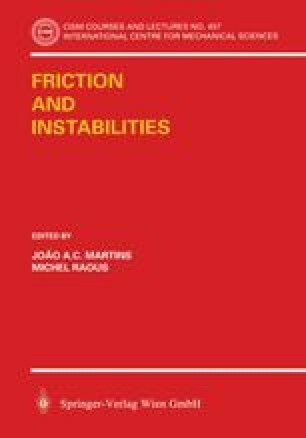 The present lecture notes are devoted to two important aspects of contact interaction, namely the constitutive modelling of slip and friction rules and stability conditions. In considering normal and tangential contact tractions and the conjugate elastic and slip displacements, only elastic-frictional response is considered, thus neglecting plastic asperity interaction and the related phenomena of asperity flattening or crushing. However, the anisotropy of contact asperities was accounted for and the respective frictional slip and wear rules are considered. Next, for a nonuniform contact interaction, the evolution of slip zones is discussed for two simple cases of an elastic strip interacting with the frictional foundation and two interacting spheres under normal and tangential loading. The slip and memory rules require introduction of consecutive active loading and memory surfaces in order to describe properly the friction hysteresis phenomena. The description is very similar to that used in the plasticity theory for modelling elasto-plastic cyclic response of materials.